Thanks for pointing me in the direction of your script (and as a consequence some of your music, fantastic work!) this is already quite close to what I’m looking for. Are these the only values that Lua will allow you to measure or is this just based on your concept for Sway? Would it be possible for Norns to react to these parameters, not only by changing the processing type but by outputting a user-determined midi-note/gate when the value reaches a certain threshold or advance a sequencer which outputs midi? Perhaps it would even be possible for this threshold to trigger one or more notes similar to what is demonstrated in Study no 5. Streams? If this would be possible in some form, Norns could quite possibly become like an extension of the acoustic instrument itself, not only processing audio but also generating pitch-material as well based on the input. I feel like this could open up a whole new area in terms of composition which I find more and more exciting the more I let all of the ideas presented in the studies and other users work sink in. Thanks for the kind words! For Sway, right now those are the three analysis parameters that are controlling the system, but I would imagine adding more down the line and refining them as I learn more about audio analysis. For example, spectral flatness is also an analysis value available in the engine, but I’m not using it for anything just yet. Take a look at the Analysis Ugens available in SuperCollider and that will give you an idea of what is possible with norns. Yes, you could have audio analysis trigger just about anything. If you’re primarily interested in norns doing this and not just SuperCollider on the computer then I’d look into the norns docs for polls and osc I still need to learn a bit more on how to better integrate the LUA side into my engines cause right now I’m using SuperCollider to do most of the audio processing and data management whereas it might be better to port over some of the data management to the LUA side. Thanks for clarifying and providing the tables for what SuperCollider is capable of analyzing, this is truly fascinating to me since I’m completely new to coding and thus have no real grasp of what may or may not be possible. With all of these analysis tools at ones disposal, any input could quite possibly be turned into a full-fledged instrument in itself not to mention the way this could open up possibilities for overcoming certain instruments inborn limitations like the relative (at least compared to a bowed instrument like your double bass) lack of sustain of a classical guitar which is my main instrument in the acoustic arena. I’m not ruling out that I will dive into SuperCollider using a regular laptop sooner or later but for now I 'm thinking that Norns might be more accessible since I’ll be able to code with Lua which I think I will be able to wrap my head around with some studying even though I have never attempted anything like this before. Reading through the studies, the language appears quite logical. 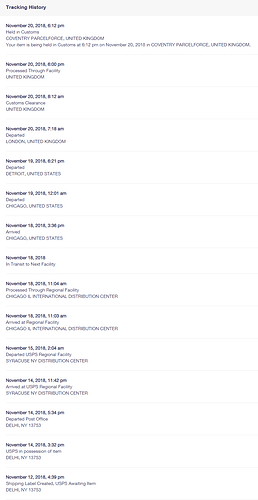 I recently had something shipped from EU to the US and it was listed as being hung up in customs for weeks, even though it had showed up to my door with no postage or anything after just a few days…perhaps a reflection of the world we live in, you know, sending around curious looking devices and whatnot. good luck! I haven’t really heard anything about ships and planes getting lost in the “Bermuda Triangle” for quite some time, but customs might as well be. 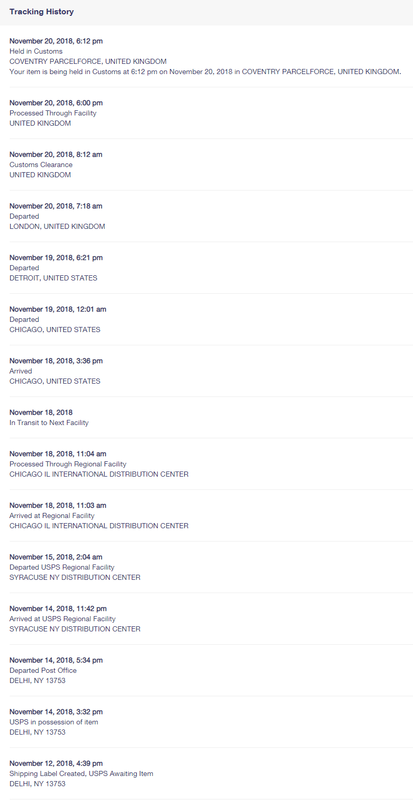 Tracking info for overseas packages seems to bear no actual resemblance to reality. Sometimes packages get returned to sender 4 weeks after they were sent. Other times they arrive at their destination almost too quickly to explain. deleted pics - better - How are you packing your grids/arcs/norns? Really been looking forward to TT ports! Any issues with fitment after yours was done printing? I just had one printed at my local library yesterday and noticed that the spot for the WiFi nub is a little out of place. I may have to have another one made. Even when I take the WiFi adapter off I almost have to force my Norns to fit inside it. meadowphysics port. still working on glpyhs/saving, but everything else is working. I’ve finally got time for norns again. New scripts in a week or two. I checked this out today and for the life of me I could not get any audio out. I think I must be missing something really really obvious, but couldn’t work it out. I saw samples loaded up in there but no audio even after checking all the vol settings. I tried the Strides app after that and got audio from samples with no issues. ugh. yup thanks for pointing this out. looks like I made some sort of mistake in pushing my last revision of the meadowphysics.lua library file to github. hopefully I can resolve this later today. Here’s a preview/tutorial for Zellen (German for “cells”), a Game of Life based sequencer that I’ve been working on. It’s almost ready for a dust pull request - just need to do some code clean up. It can be used with a midi device or with the PolyPerc engine on its own. Currently it doesn’t sync via midi, but it’s at the top of my todo list. There’s also a readme that explains the most important settings. Wow @sbaio this is incredible! Can’t wait to try it out.